Advertiser.ie - VTS; Galway's newest family member! VTS; Galway's newest family member! Looking for Cuban cigars for that celebratory occasion? Searching for a unique gift? Perhaps the retro look of the pipe is what is wanted? VTS Galway's newest store is the city's one stop smoke shop for these products and much more. Having opened last Friday, owner Sepi's mission is to bring high-quality smoking and vape products to the heart of Galway city centre. "We pride ourselves here at VTS (Vape & Tobacco Specialists ) on providing customers with the best products combined with the best customer service. We have a vast range of products from additive-free tobacco and cigarillos to coils and tanks, and if you cannot find it in the shop, we will help to source it for you. Our products are of the highest quality and are very competitively priced." Located at 3 Kirwan's Lane (beside Goyas ), Sepi guarantees a relaxing, chilled out shopping experience and when you go into the store and Sepi is busy with a customer, one of her three assistants, Whiskey (Rottweiler ), Chocolate (Jack Russell ), and Bouncer (Chihuahua ), will be on hand to provide help as well as a few cuddles. And if securing the perfect purchase and a play with a pup was not enough, Sepi also has some delicious cookies for customers to enjoy while in store. 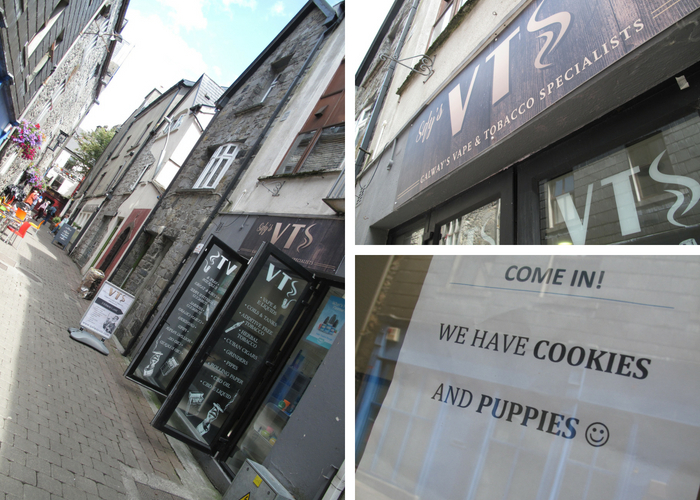 With the store now open, Sepi says VTS will be launching its online store very soon. "The online store will enable customers to any purchase of our products that we have here from the comfort of their own homes." What will we do now on April Fool’s Day if the Arabs buy United?